In January 2014, a trial excavation was conducted in a new neighborhood in Kibbutz Afiq (Permit No. A-7011; map ref. 266175/742400). The excavation, undertaken on behalf of the Israel Antiquities Authority and financed by the Doral Group, was directed by R. Assis (inscription drawing and photography), with the assistance of O. Zingboym (administration), M. Kahan (surveying and drafting), A. Shapiro (GPS and mapping), H. Tahan-Rosen (pottery drawing) and L. Di Segni and D. Syon (Greek inscription). 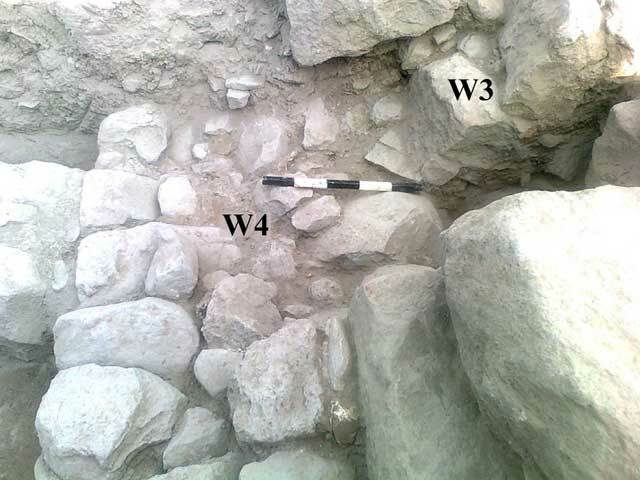 An excavation area (2.5 × 9.0 m; Fig. 1) was opened near the road south the kibbutz. Two occupation strata were exposed, dating to the Mamluk period (Stratum 2) and to Ottoman period (Stratum 1). V. Guérin, who described the partially ruined village of Fiq at the same place, said that ancient architectural elements were incorporated in the walls of the houses in secondary use (Guérin 1985:212). 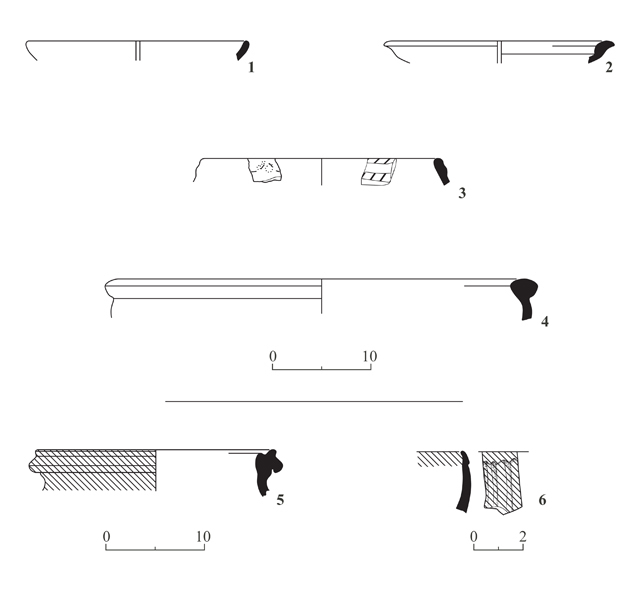 Remains of the Middle Bronze Age II and of the Hellenistic–Mamluk periods were identified in previous excavations and surveys (Zingboym 2009; Hartal and Ben Efraim 2012: Site 95). A stone pavement and an oil press from the Byzantine period were uncovered c. 10 m south of the current excavation area (Kastenbaum 1984). Stratum 2 (Mamluk period; twelfth–fourteenth centuries CE). 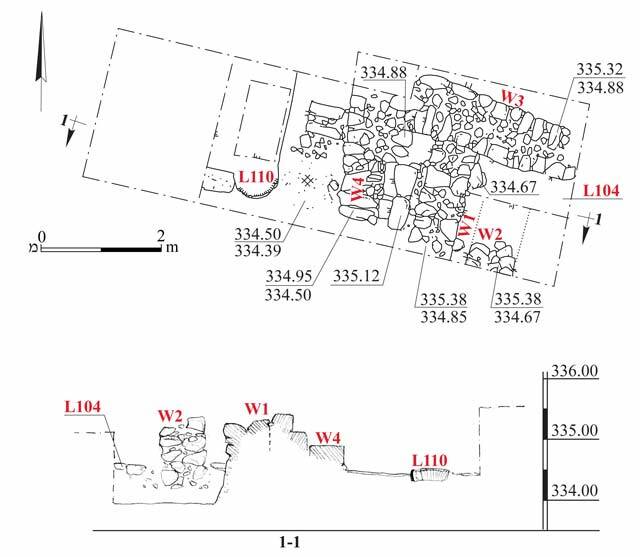 Remains of a building were exposed, comprising two wide walls which formed a corner (W3, W4; width 1 m; Fig. 2). The walls were constructed of two rows of large basalt stones. A plaster floor (L109; thickness 2 cm) with a tabun (L110) dug into it abuts W4 from the west. A fragment of a base or a capital of an ancient column was incorporated into W3. The walls were erected on a fine-grained earth fill (thickness 1.5 m) that was laid over the bedrock and levelled. Construction on levelled fill may indicate an extension of the settlement to previously uninhabited areas. Fragments of Mamluk-period pottery include bowls (Fig. 3:1, 2), a glazed bowl (Fig. 3:3) and a large basin (Fig. 3:4). Stratum 1 (Ottoman period; fifteenth–nineteenth centuries CE). Two construction phases were identified in this stratum. 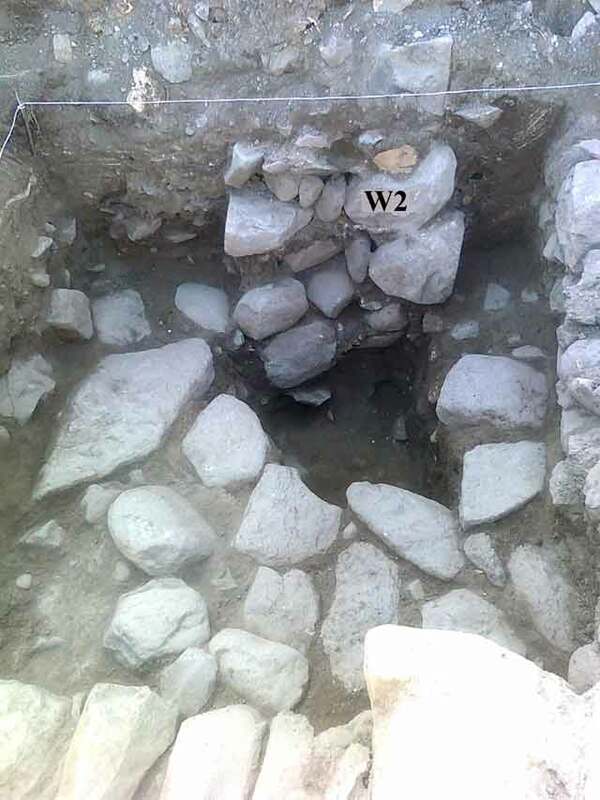 A dry-construction wall (W1; width 0.8 m) abutting W3 from the south and a stone pavement (L104; Fig. 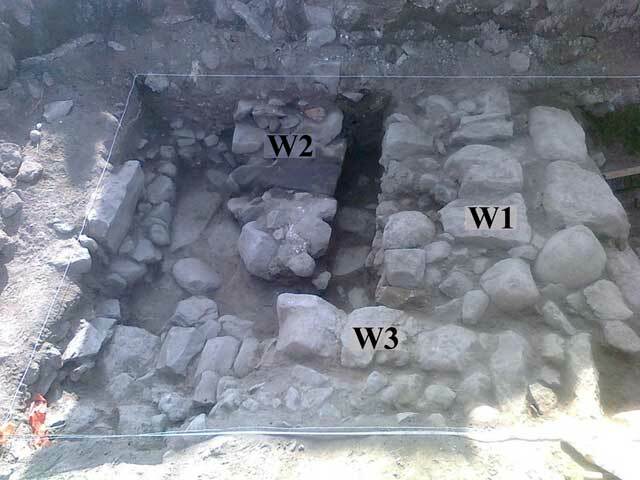 4) bounded by Walls 1 and 3 were attributed to the first phase. A wall (W2; width 0.8 m) that severed and canceled Pavement 104 (Fig. 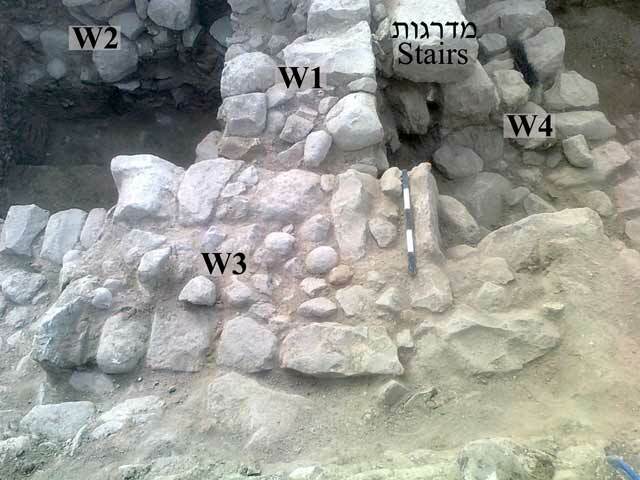 5) and a staircase that was founded on the earlier walls and canceled them (Fig. 6), were ascribed to the second phase. Fine-grained white mortar was used in the construction of W2 and the stairs. The buildings were damaged in the twentieth century, when the road to the kibbutz was paved. The Ottoman-period pottery, primarily body fragments, includes a large basin (Fig. 3:5) and fragment of a tobacco pipe (Fig. 3:6). 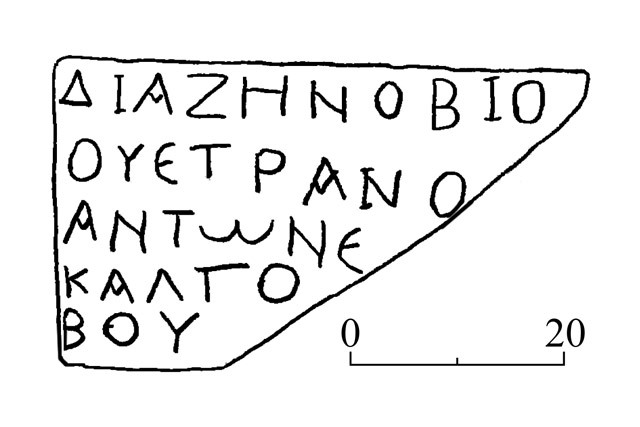 A fragment of a large basalt stone with an engraved inscription in ancient Greek was incorporated in W2. The inscription dates to the end of the Roman period (fourth century CE at the latest; Figs. 7, 8). Although not preserved in its entirety, it seems to be a five-lines dedicatory inscription. Zenubius veteranus (Zenubius the veteran) and a man named Antonionus, whose other name may be Calpurnius, are mentioned in the inscription. Zenubius may have been a veteran Roman legionnaire who settled in the region, possibly as part of the practice of settling army veterans in different areas of the empire. The three letters in the last line may be the boule, i.e. the city council. Sussita is the nearest city to the site, and the inscription may refer to a member of the Sussita city council. 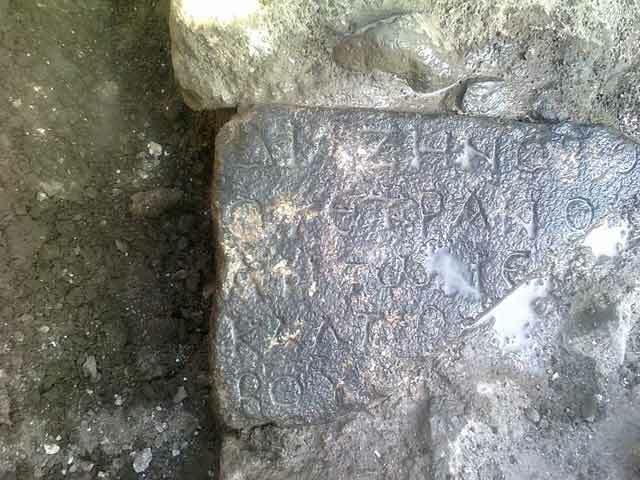 Several inscriptions were discovered during the excavations at Sussita, among them the “forum inscription" which refers to a man by the name of Calpurnius, who was a member of the city council (M. Eisenberg, pers. comm.). Guérin V. 1985. A Georgaphic, Historic and Archaeological Description of the Land of Israel 6: The Galilee (A) (transl. from the French 1880 ed. by H. Ben-Amram). Jerusalem (Hebrew). Zingboym. O. 2009. Afiq. HA-ESI 121. 2. The corner of Walls 3 and 4, looking north. 4. The stone pavement bounded by Walls 1 and 3, looking south. 5. Wall 2, cutting through the stone pavement, looking south. 6. Walls 1 and 3; to their right, the staircase that was founded on top of them, looking south. 7. A stone bearing an engraved inscription. 8. Drawing of the inscription.